My Green Thumb Eats Apple Cake | Does This Font Make Me Look Fat? Last Friday was my monthly Green Thumb meeting. This is a group of gardeners who are members of the St. Michaels Woman’s Club. We get together for informational meetings, gardening workshops and road trips. This year I am co-chairing Green Thumb with my friend, Carol, who is terrific to work with. We have some different skill sets which makes for a good partnership. Plus, she always makes me laugh which is a very good thing. 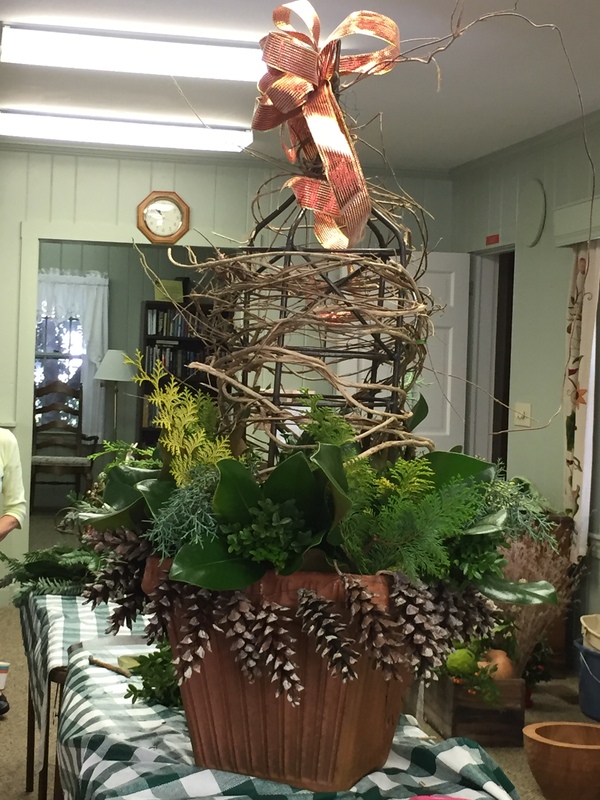 The speaker at this month’s meeting was a local floral designer, Nancy Beatty. She was showing us ways to use greens to fill our outdoor containers and window boxes. And she also demonstrated some fantastic indoor arrangements. 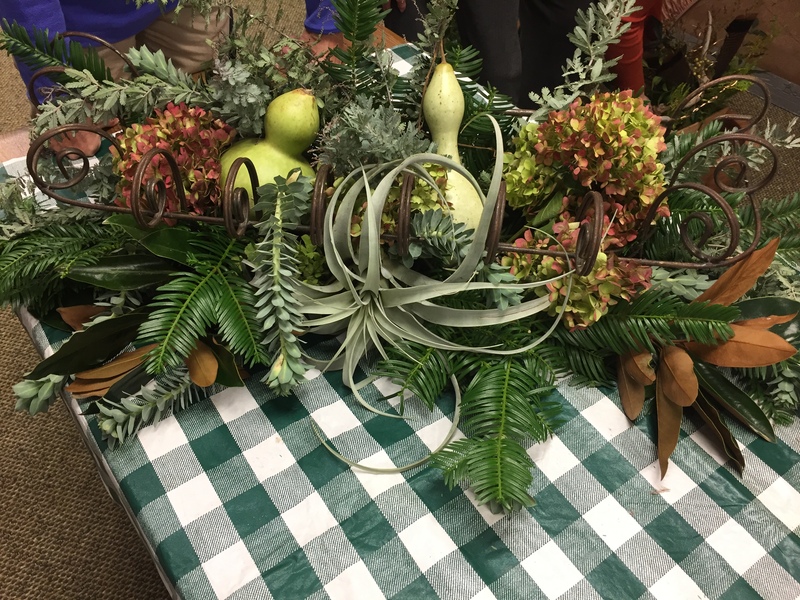 The tillandsia (air plant) in the arrangement below acts like a bow, but it’s a tropical plant that would not tolerate outdoor freezing temps. Replace the tillandsia with a red bow, however, and this arrangement would easily transition to the winter holidays. Nancy lives in the country and scavenges the fields and forests near her house for plant material and interesting embellishments. 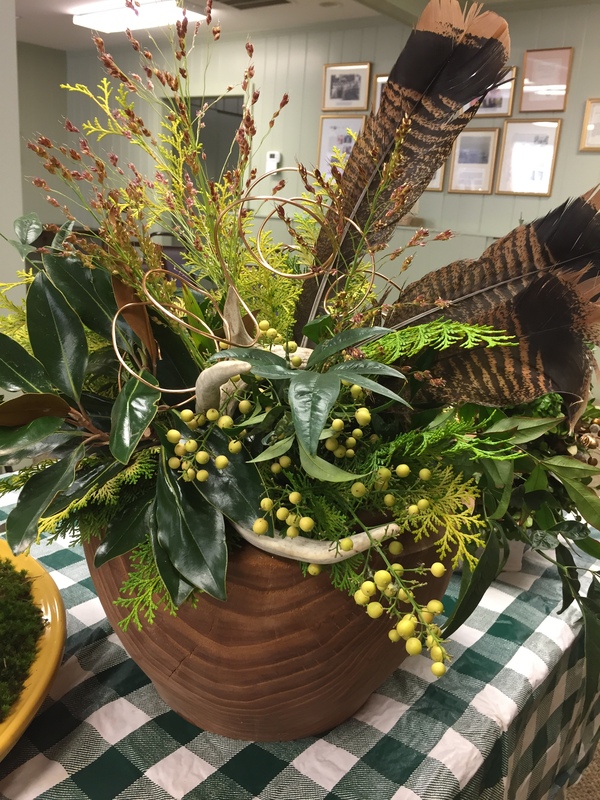 She found the turkey feathers and even the deer antlers used in the arrangement below. Nancy assured us that she gets permission from her neighbors to forage in their woods. The scrolly things are copper wire. An outdoor container with the summer plants removed makes a perfect foundation for a tall, sculptural arrangement that will last through the winter. The plant materials are just stuck into the potting soil. The wrought iron tower is wrapped with honeysuckle vine Nancy found in the woods. When it’s fresh, she told us it doesn’t have to be soaked. A white pine cone garland drapes the edges of the pot. She showed us how to make them with only pine cones and wire. 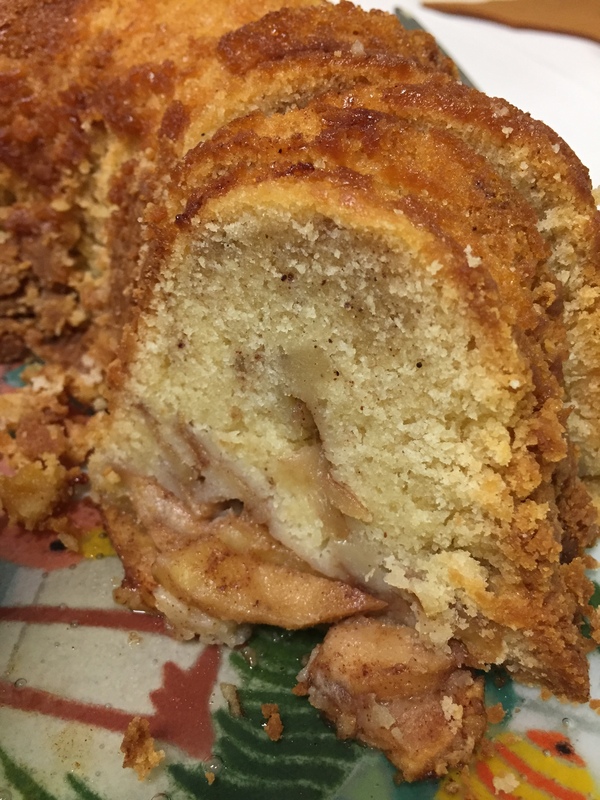 We always have refreshments at our meetings and women take turns being “hostesses.” At this meeting another friend, Diane, baked an Apple Cake that was outstanding. She said I could share the recipe on my blog. I think I sent my bundt and angel food cake pans to the thrift shop. Seems every time I do something like that I need the darn things later. This recipe might just make it to the Thanksgiving table. 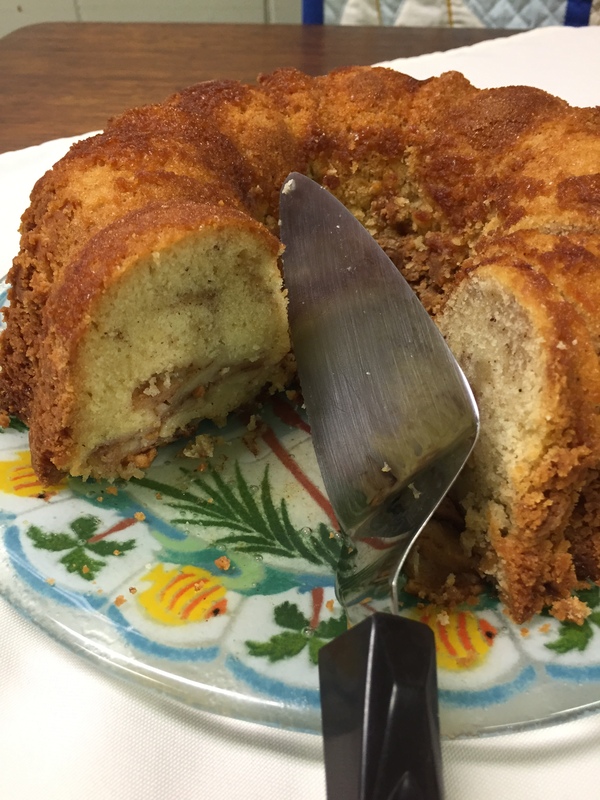 This entry was posted in Cooking, Gardening, Thanksgiving, Uncategorized and tagged Arrangement of Winter Greens, Green Thumb Gardening Group, Jewish Apple Cake, Nancy Beatty, St. Michaels MD, Woman's Club of St. Michaels by Mala Burt. Bookmark the permalink. You don’t need a bundt pan. My family has been making it for years in sheet cake form before bundt pans were invented. So you don’t layer it quite so much? We just mix the apples in last and when it’s poured in the pan make sure the apples are spread out evenly.